Since I got my hands on a gorgeous iPad Mini for my birthday, I've been searching high and low for the perfect case that will keep my tech safe and sound, free from scratches, and most of all something that will keep it looking uber cute and fashionable! Call me impractical, but I know your all secretly looking for the same thing! I got the standard crazy pink Apple Smart Cover, which looks great, however the back of my iPad isn't protected. As soon as I'm wanting to head off on an adventure and slot little mini into my handbag; which is full of various other impractical things, its very likely to get scratched. I was really disappointed with my high street finds, I knew exactly what I wanted but nothing seemed to match up. Everything on sale was boring, full of plain bog standard colours and designs, and lacked any kind of cute adorning animal on the front. And most of all, for what I could get, they were all so darn expensive! I wasn't willing to settle and prolonged my search in the hope that I would stumble across something exquisite online. I asked around on Twitter and it seemed like a lot were in search of the same thing. 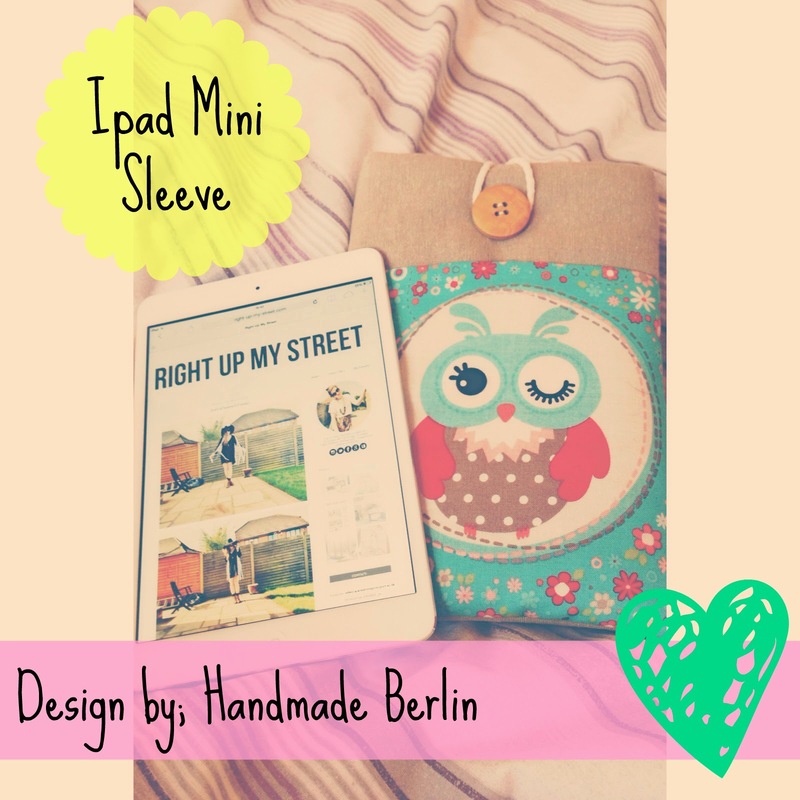 That's when I stumbled across the utterly adorable designs by Handmade Berlin over on Etsy. I couldn't believe my luck, endless cute handmade designs, for a more than affordable price. Handmade in Germany, 'Handmade Berlin' really do create an eco-friendly and cosy home for your electronic device, and that being exactly what I wanted! There's even a pocket at the front where you can slot in your headphones. Not only do they offer iPad cases, laptop sleeves, kindle cases and e-readers too, they can also cater for custom orders, i.e. I got mine so it would fit my iPad mini with its apple smart cover intact! I was so pleased with what I received after finding so much crap on the high street, and now I have my own little eco-friendly smiley owl on soft fabric made from all organic products, including natural wood button and yarn. I was desperate to share my find with you all! There's 15% off all orders at the moment which means the prices are even more dreamy and you should all definitely get your hands on one! As some of you may know, on the weekend after my graduation, I happened to loose my footing in some new heels and fell down some stairs, so I have now broken my arm! Such an inconvenience, I'm stuck at home with nothing to do but sit still and rest my bones, so I can try and help them mend. Still unsure as to whether I need an operation or not.. I've broken my left arm, which happens to be my writing hand, boohoooo. However, I am now attempting to write this post with my right, fingers slamming the keys one at a time, as you can imagine I'm very slow. I'm going to post as of when I can, as I'm going to be bored out of my mind and who knows how long this process could take! Outfit posts will have to take a back seat, as I can hardly move etc. What great timing when my job hunt is meant to be underway..
Aw it's adorable! When I finally get my hands on an iPad I'll definitely be investing in one of these! Hope you feel better soon with your arm, sending hugs! i saw these on etsy, so cute! The case is so cute, i've heard so much about Etsy but i've never been on! This is so cute! Love the owl and floral print. How adorable is this!? CUTE!